Antique transistor and tube AM/short wave radios can be fun restoration projects. One of the restoration tasks involves the alignment of the receiver's local oscillator so that the dial readout correctly represents where the receiver is tuned. This circuit can produce amplitude modulated (AM) tones on various frequencies that these receivers typically receive. As shown in the schematicf, the circuit produces signals at 10, 5, 2.5, 1.25 and 0.6125 Mhz. By changing the master oscillator block from 10 Mhz to 16Mhz, the generated frequencies can be changed to 16, 8, 4, 2 and 1 Mhz. These oscillator blocks can often be salvaged from discarded computer devices, good sources are old PC motherboards, ethernet cards, video cards and disk drives. New oscillators are also readily available. The oscillator block is a self-contained device that runs on a 5V DC power source and produces a fixed-frequency square wave signal. This is used as the master clock oscillator and produces the highest frequency for the generator. The master clock is fed to a 74LS93 divide by 16 counter IC which produces sub-frequencies at 1/2, 1/4, 1/8 and 1/16 of the master clock frequency. The audio oscillator uses two sections of a 74LS00 wired with a feedback loop to produce a 1.3 Khz square wave. This signal is NANDed with one of the five HF signals to produce an AM modulated waveform. The modulation involves a simple on/off switching of the carrier wave at the audio frequency, it is simple but effective for the task at hand. The circuit was built on a hand-wired prototype board as shown in the photo, a more permanent circuit could be built with a "OnePas" prototype board or a hand-wired perf-board. IC sockets are recommended for more permanent wiring jobs. Selection of the available frequencies can be done with an optional 1P5T rotary switch or a board-mounted 5 position DIP switch. In the prototype shown, frequency selection is done by moving a jumper wire. The 5VDC supply is provided by an external DC power supply, four 1.25 NiMH cells could also be used. If you use NiMH cells, don't forget to add a fuse and a switch. It is a good idea to build the circuit into a small metal box, use insulated standoffs and machine screws to mount the board to the box. 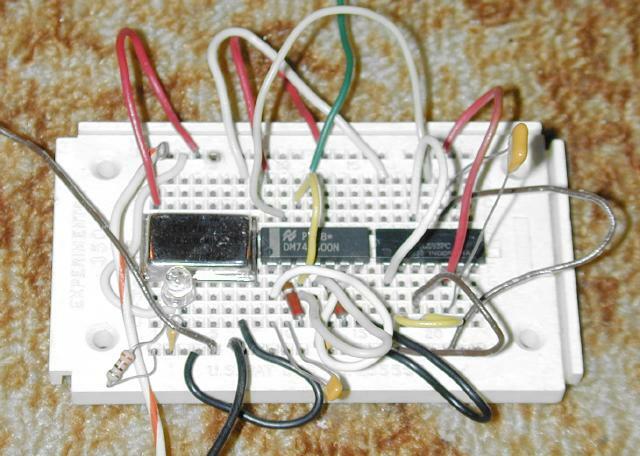 Apply power to the circuit, select an appropriate frequency by connecting the 74LS00 pin 13 to the desired frequency source, and use a test lead to place the Modulated RF Out signal near the receiver's antenna input. The circuit has no DC isolation as shown, if you want to connect directly to the receiver's RF input, use a 1nF capacitor between the Modulated RF Out and the receiver's antenna input. If direct connection to the antenna connection overloads the receiver, just move the RF Out signal a few inches away from the antenna input. Set the receiver to the desired band and tune around until you hear the 1.3Khz audio tone. If you are unsure if the tone is coming from the calibrator, power the device off and see if the tone disappears. Adjust the receiver's oscillator and retune for the calibrator tone until the dial reads the correct frequency. 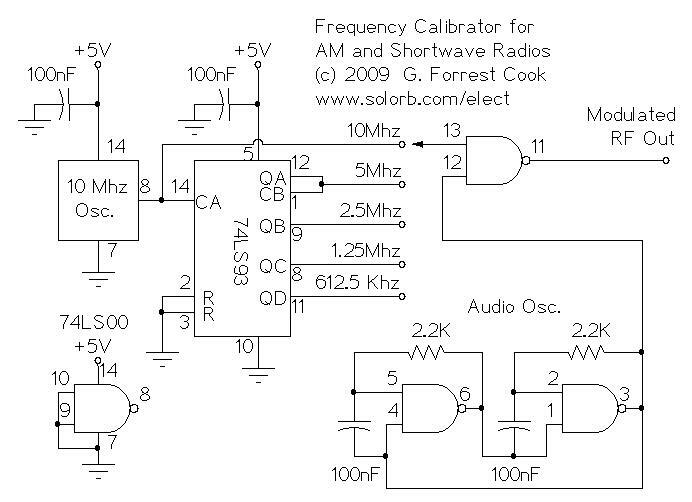 Repeat this procedure for all bands by selecting the appropriate calibrator output frequency. The calibrator generates a signal that is wide in harmonic content. This may result in multiple signals showing up on the receiver's dial, the problem may be worse on inexpensive radios that suffer from imaging problems. The best way around the issue is to decrease the coupling between the calibrator and the radio to a point where the signal is fairly weak. If multiple signals still persist, tune the radio to the strongest signal.